Diana Krall is a legend in jazz circles. The beautiful singer and pianist knows how to enthral an audience with the jazz genre, known to spread calm and help people meditate. Krall, unlike most jazz artists around the world, has managed to churn out quite a number of albums. Totalling over ten albums over the course of her career, she has an enviable discography that has easily given her a place as one of the bestselling jazz artists of her time. She is indeed a woman worth knowing and below, we will look at some important facts about the spectacular jazz musician’s life and career. Diana Krall came into this world on the 16th of November 1964. She was born in Canada, in a place known as Nanaimo in British Columbia. Despite being a Canadian by birth, she has made music that has gone around the world, but all that did not happen at once. She started studying and playing the piano pretty early at the age of four, even taking exams through the Royal Conservatory of Music. She got into jazz in high school when she joined a student jazz group. By the age of 15, Diana was already playing in local restaurants professionally. It is not surprising that a musician as good as she is, even at that young age, won a scholarship to attend the Berklee College of Music in Boston. She rounded up her studies there in 1983 and moved to Los Angeles to play jazz. Diana Krall is obviously a stickler for putting in her time to what she loves to do. Not only did she make sure to complete her schooling, but it also took her ten years to gather experience before she finally went back home to Canada to release her first album. She named the album Stepping Out, and it saw her stepping out with both Jeff Hamilton and John Clayton. The album proved to be aptly named as it brought Krall to the attention of producer Tommy LiPuma. It was LiPuma who helped her produce her second album titled Only Trust Your Heart. It was, however, her third album named All for You: A Dedication to the Nat King Cole Trio that stayed for 70 weeks on the Billboard jazz charts and got her nominated for a Grammy. This was obviously a great height in her career and Diana Krall could have rested on her oars but she stuck to the craft and continued putting out great records. The year 2001 was the year that she decided to begin a world tour. Her concert at the Paris Olympia, Diana Krall – Live in Paris, led to her putting out her first live record. The album saw her cover Just The Way You Are by Billy Joel and Joni Mitchell’s A Case Of You. Following her marriage to her British musician husband, she began to work with him as a lyricist. At the same time, she also pushed herself further to begin composing her own songs, and all that hard work led to the release of an album in April 2004 called The Girl in the Other Room. The album was a huge success beyond her home country of Canada. It especially found success in the United Kingdom where it rose to the top five, and Australia also showed some love as the album entered the top 40 album charts. Diana Krall also takes the cake for producing Barbra Streisand‘s album Love Is the Answer in 2009. Her spectacular career saw to her induction into Canada’s Walk of Fame. Diana Krall has always been a lover of music, and so, on the 6th of December 2003, she got married to a man who shares the same interest. The beautiful and talented musician got married to a British musician as we mentioned earlier. 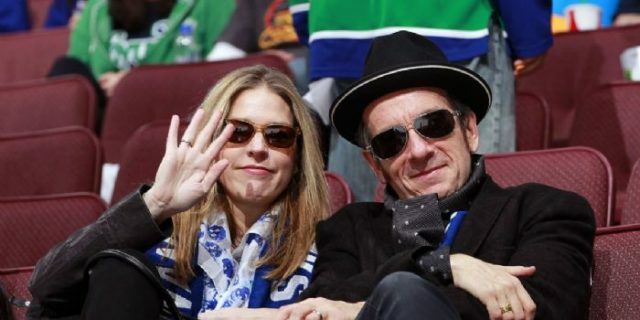 Her husband’s name is Elvis Costello and the two got joined together in holy matrimony at Elton John’s estate. As if their story and life were not already idyllic enough, three years later, precisely on the 6th of December 2006, they were blessed with their twin sons – Dexter Henry Lorcan and Frank Harlan James. The family, no doubt, has an awesome time everytime the 6th of December comes around as it would be for them a celebration of love. Diana Krall had a pretty humble beginning in Canada. The Krall family is a big part of who she has grown to become. Her mother’s name is Adella A. (née Wende), and she was an elementary school teacher. Her father’s name is Stephen James “Jim” Krall, a man who supported his family with his earnings as an accountant. She has only one sibling named Michelle Krall. Her singing and piano skills probably came from her parents – her father would often play the piano at home and her mother was known to sing in the community choir. Diana Krall lost her mother in 2002 to multiple myeloma.